As you may recall, the former owner of this place left behind heaps of junk. Amidst the junk, there have been a few useful items. There have also been some items that we have found new uses for (apart from bonfire fuel, that is). This is the story of how I turned a rather uninspiring old desk into a chicken nest box. 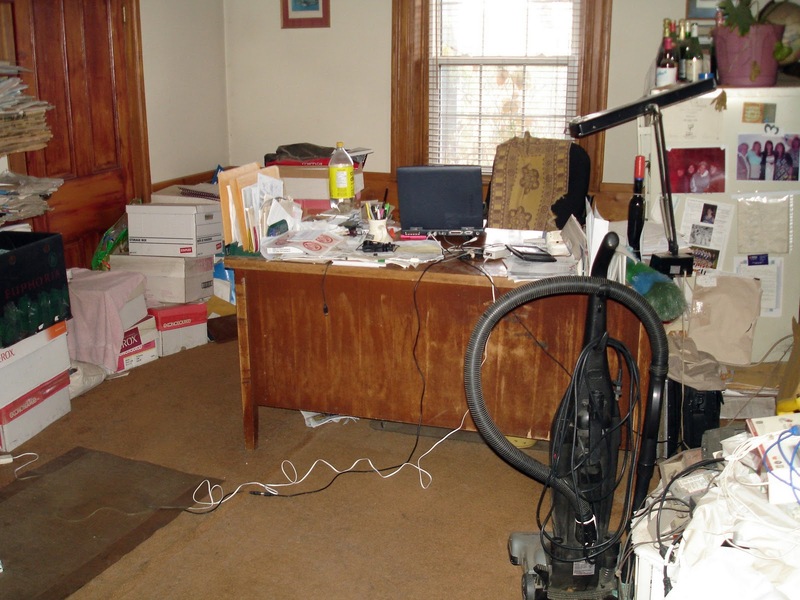 The desk in question was in the "office" room of the house, which looked pretty much like this when we moved in. Oh wait, you can barely see it. Yup, that's my point. Another blog will be coming soon on the office space - I'm in the midst of re-doing it. Once the desk was cleaned off, we determined that it was a very heavy, solid, hardwood desk, not unlike old fashioned teachers' desks. There were 6 drawers, and some of them had pieces of masonite that could be slid into diagonal slots - sort of paper holders within the drawer. In addition, this desk had the interesting feature of having a typewriter on a hidden shelf, which rose up when the top part was lifted. It was sort of nifty, if you wanted a typewriter desk, but we didn't. Additionally, it has a very heavy and thick layer of some kind of shiny varnish on it....like a skating rink for pens. There are bubbles in the varnish too. Not all that nice, really. Richard figured it would make good firewood. I looked at it for a while, and saw in my mind's eye... a chicken nest box. I convinced him to help me haul it out to the barn, and today, I brought it back to life in a new way! Here's where I began - I had removed all the drawers and had disassembled the hinge bits that made the typewriter shelf move up (you can see a sort of triangle shape on the far side from where the hinge thing was located. This was the top piece, which I removed. You can see the handle on the front, which was used to lift it, and that engaged the hidden typewriter shelf. Here is the typewriter shelf, which had the typewriter bolted to it. It was also removed! The first thing I did was remove the drawer slides for the top set of 2 drawers. You can see them sitting on top of the desk here. The openings are now larger for the side nest box units. I also removed matching slide-out shelf bits that were on either side above the top drawer. After that, I put the bottom drawers back in on each side, as seen below. In the centre portion, which now had the top and typewriter shelf removed, I built a 3-sided surround at the base (the light coloured wood in the picture below) to support the typewriter shelf in its new position. That shelf had a "lip" at the back of about 4 inches, so I left a space between the back piece of the surround and the back of the desk to insert the lip, so that the shelf piece could not move forward or back, but could easily be removed for cleaning. Here is the re-purposed typewriter shelf in place. Then, I used one of the old pull-out writing surface boards as a divider on the centre of the shelf, to make it into two nest box areas. I placed two pieces (from the removed drawer slides) on the back wall of the desk to support it. Then, I made a sliding groove with two other pieces of the former drawer slides to support it on either side. Now the divider stays in place but can be removed for cleaning purposes. After the divider was in place, I made a support for the front that is also held in place by two small blocks. This piece can also easily be lifted out. I'm hoping it will discourage goats from trying to sleep inside the nest box part. So now you can see the 4 nest box units - one in each drawer, and two in the centre. I also placed some extra support to hold the top in place, but it can be lifted out for cleaning. It's very heavy wood. I knew the goats would jump on it, which is why I wanted the extra support. One great thing about this is how easy it will be to clean. The two drawers can be pulled out, the shavings dumped, and new shavings put in. The centre section can be cleaned out easily, and the heavy varnishing on the top and on the typewriter shelf (which is the base of the two centre boxes) should mean that chicken poop will easily be brushed off and will not stick. The varnish is sort of like teflon! I filled each nest box unit with clean shavings. Unfortunately, I left my fake eggs in Iowa on my old farm. I shall have to find some new ones, or sacrifice a few "real" eggs from the store to teach the chickens what this thing is for! I do hope they'll use it. The flash photography makes it look brighter in this part of the barn than it really is. The area is dark and the nest cubbies are nice and private, so the hens should appreciate that. Sometimes hens choose their own places to lay, but I shall try to encourage them here. Nobody's laying right now, but the 7 we got earlier this year should start soon because they're approaching 5 months of age, and the cuckoo maran should start laying soon I hope, now that she has finished moulting. ...which is just as well because the weather tomorrow is due to be dreadful - snow and/or rain all night and all day tomorrow. Here, one of my Polish hens shakes herself off after a dust bath. The dirt adheres to oils on their feathers and helps keep them clean and free of lice or other parasites. Hopefully tomorrow's weather will encourage some serious investigation of their new nesting area! OOo. How inventive are you? You are very good at making the lemonade out of the lemons! The stupid Farm chickens just lay anywhere in spite of the nice chicken tractors that the male person built. Your chickens should love the one you built as it is lovely and a brilliant use of an old desk. The publicist actually watched one of the new hens walk along the other day, squat, drop an egg on the concrete (it cracked) and continue walking. Wonderful job!! I love it !! Oh my, how posh. Figures the chickens get their new place fixed up before you do! How fabulous is that! What a great use for that old thing. I'm sure the ladies will love it. What a wonderfully creative idea. You are so creative! I hope they enjoy the nest boxes. I've even had the ducks using my nest boxes before. Claire, you've been lying to me all this time! You're an engineer, not a lawyer!!! Fabulous idea and job! Leave it to you, Claire. You really do see beauty in all things, don't you? Wait-you're saying that that stuff was THERE when you moved in? Oh, for Mimi to have the opportunity to wade through someone elses mass of junque! That's the stuff my dreams are made of!